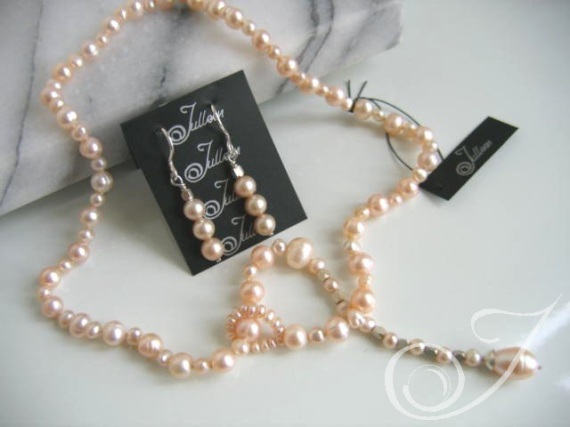 This Pink Pearl Lariat is loose and gentle and is ever so light to wear. As with our other lariats in a variety of shades and colours, this style is so versatile. Worn as a choker with the long bit hanging down the back or down the front in the centre or on the side for something different. It also doubles as a bracelet. These petal soft matching earrings are perfectly round 7mm dreamy pink champagne pearls set on all sterling silver. As with any other design in our catalogue, we offer you the option of choosing this style in other colours. Please just ask. We’d love to hear your views on this service and rate this product. All comments are most welcome. Rhoena Necklace or Sandra Cluster Earrings. One of my favourite pictures of Eva..is this one wearing a long pearl necklace worn with a knot in the centre. Again my inspiration of some designs come from the strangest places but often from a retro picture of a silver screen beauty from a by gone era. Voila Ms Gardner in all her natural magnificent splendor. Love her! and love our lariat pearl necklace Rhoena.